Eaglemoss presents the Alien and Predator figurine collection! Your favorite characters from the sci-fi franchise are meticulously rendered 1:16 scale, standing approximately 6 1/5-inches tall. 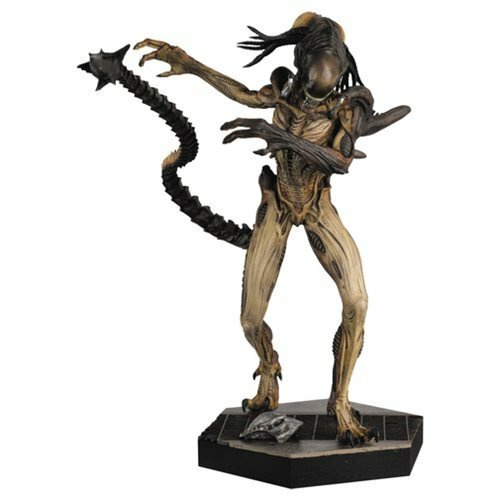 This AVP Predalien Statue comes with the volume #11 companion guide that explores the creature. Ready for attack, the Alien and Predator Alien vs. Predator Predalien Figure with Collector Magazine #11 is cast in metallic resin and hand painted. First appearing in its early chestburster form in 2004's Alien vs. Predator, the Predalien is the terrifying result of a facehugger impregnating a Predator. As the creature grows, reappearing in the 2007 sequel, it develops terrifying speed, strength, killer instincts and the ability to start its own hive by planting embryos directly into human hosts. The Predalien figurine is presented in a standing attack pose, preparing to go in to battle with a defiant Predator warrior. Ages 14 and up.